The first Glossybox of the year is here, filled with 5 items and a themed box. Glossy teamed up with Deliciously Stella this month to put together 'The Edible Edit', the box is definitely more skin care focused but I think we all need to up our skin care routine at this time of year. 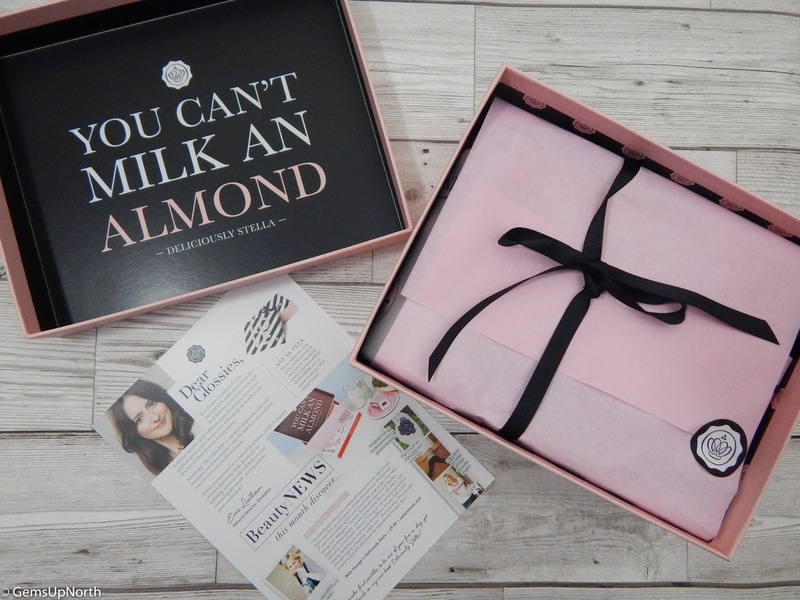 Under the lid of the usual glossy pink box is a quote from Deliciously Stella "You can't milk an almond" this was perfect for flat lay photos. I was excited to get my first sub-boxes of the year however I feel that Glossybox has let me down this month. For the first time ever in any subscription box I've received a product that had previously been featured. I tweeted Glossy to query if this was a mistake, they replied that they sometimes do put a "favourite" product in the boxes and get requests for this. I personally think that as a beauty sub-box duplicates shouldn't be made, I subscribe to beauty boxes to find new brands and products so I hasn't very pleased to see the previously received product in my box this month. There was 4 other items inside this box which are quality items that I'm pleased to sample so the whole box wasn't a flop. 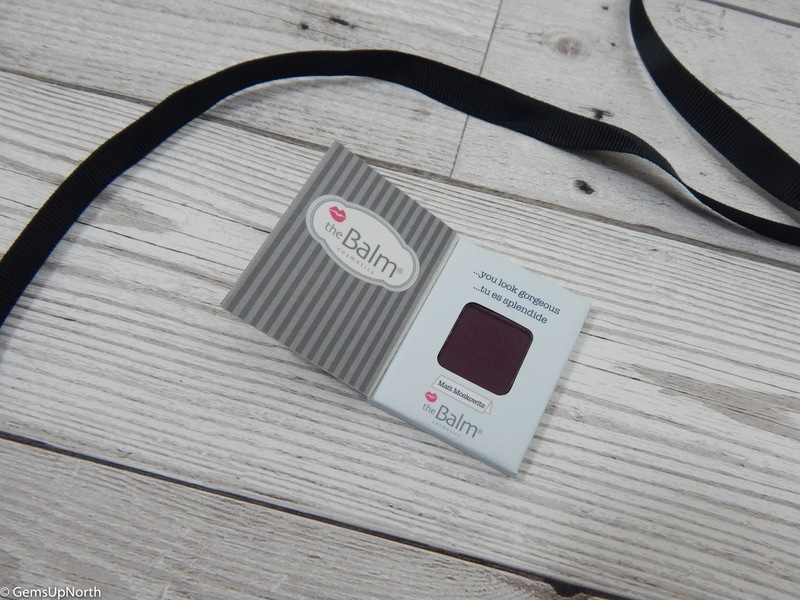 The Balm is a brand I've only tried through subscription boxes and I always find the samples to be tiny although you do get to test the product fully. This is a full size eyeshadow from the palette Meet Matt(e) Trimony, it's a dark shade which I love. The shade is an underrated colour in my opinion, I think people may stay away from this shade because of the darkness of it. You can create some amazing eye looks with shade Matt Moskowitz (dark plum) by using it as a liner or blending it into the crease of your eye and applying it on the lower lash line. Work slowly and apply in small amounts to carefully create the looks, because it is a dark shade it's easier to apply sparingly and add more if needed. The packaging on all of The Balm products always grabs my attention and this sample is no different with the book like design and vintage illustration on the front of whom I assume to be Matt(e); he has good brows too, haha! I use sheet masks regularly (once a week) so although there always seems to be a mask in every sub-box lately, I don't mind so much. 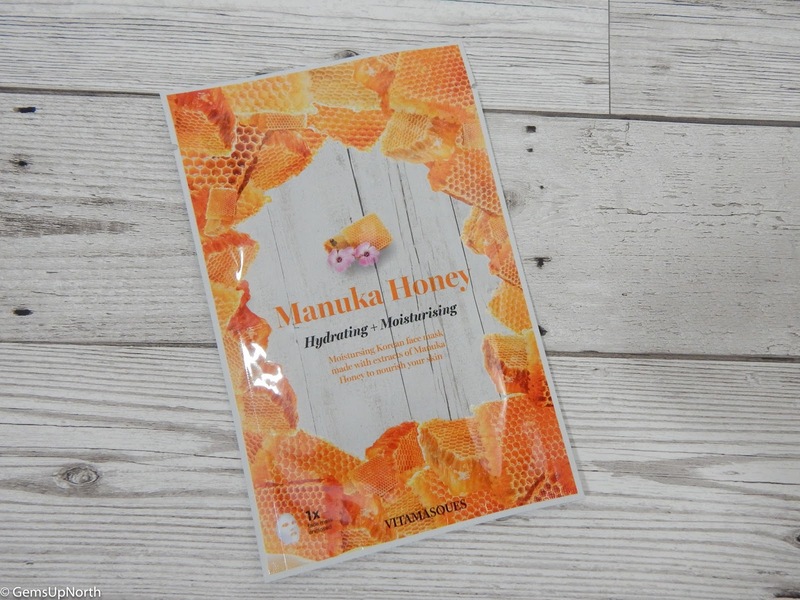 This Vitamasques sheet mask is a Korean mask made with extracts of Manuka Honey which is so nourishing for your skin. This sheet mask features triple layer technology which is a Korean Innovation; I hadn't actually heard of this before until now. The triple layer helps with absorption and I can confirm the mask adsorbed onto my skin beautifully, my skin felt so refreshed after I took the mask off and smelt amazing! The honey smoothed my skin so nicely I was super impressed so I'll be looking into buying some more of these soon. I've had one other product from Unani and that was also from Glossybox; that was the Dermo Defense face mask which I enjoyed using, you can read about it here. The Illuminate Cleanser has a lovely smell to it and it's not harsh on the skin in fact it's the opposite. The cleanser is based on nutritious natural oils that purify and protect the skin. I've used this to remove my makeup which it had no trouble doing so, I've even removed glitter eyeshadow with it at ease! My skin felt soft after using this for the whole week and I will continue to use this every evening. With the fresh scent and gentle ingredients my skin was left feeling clean, nourished and smooth. 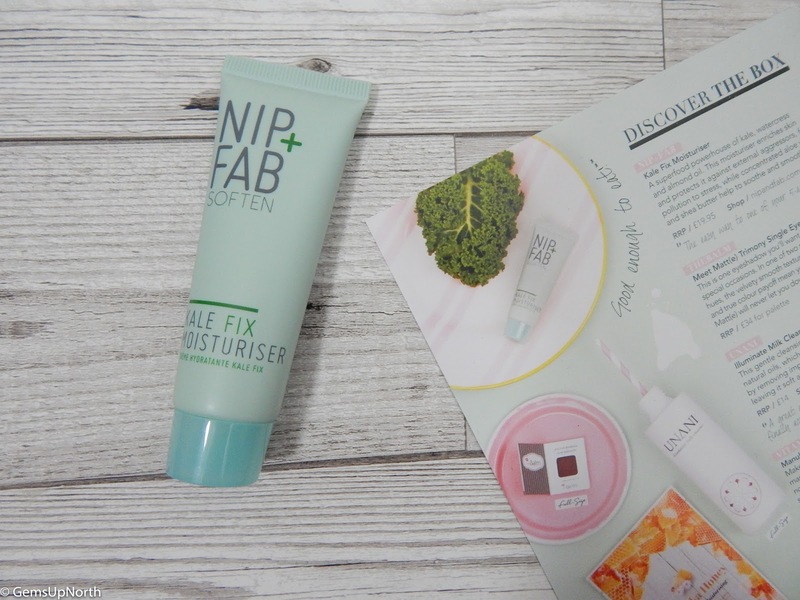 I was excited about this product when I opened the box, I'd seen that this Kale Fix moisturiser would be featured this month from the sneak peaks. Nip + Fab are a new-ish brand to me after only sampling a couple of products but I've had great results with everything I've tried. This kale moisturiser is perfect for my winter skin with superfoods kale, watercress and almond oil which enrich my skin and restore it back to normal. The advantages of this moisturiser is that it protects against pollution and stress so my skin will feel great even against the outdoor air and when I'm feeling low. The Shea butter and aloe vera help to keep my skin feeling smooth and soft and it works from the first application. I found the scent of the moisturiser to be quite earthy, I'm guessing this is because of the superfood elements, it's not off putting at all just different to what I'm used too in a moisturiser. This is the duplicate product that I received this month, I received the exact same product and colour back in my April Glossybox last year. As they are hair ties, it's not something I run out of, to be in need of some more; I'm actually still using the other ties. They are good quality and do leave my hair less kinked than a normal bobble, they also don't pull on my hair when I'm removing them so they are much more comfortable to wear. I wouldn't of minded receiving another set of these hair ties if maybe they was in another colour but I'll still make use of them. I did question cancelling my Glossybox sub after the duplicate product this month and missing item in November's (this was replaced) but have decided to give it another couple of months and see if Glossybox can improve for me again. February's sneak peak was of a themed box for Valentines Day so I'm hoping for some makeup products or something Valentine themed. I'll be reviewing that box on my blog too so check back next month to see what I receive. If you do fancy signing up to Glossybox you can do so here. 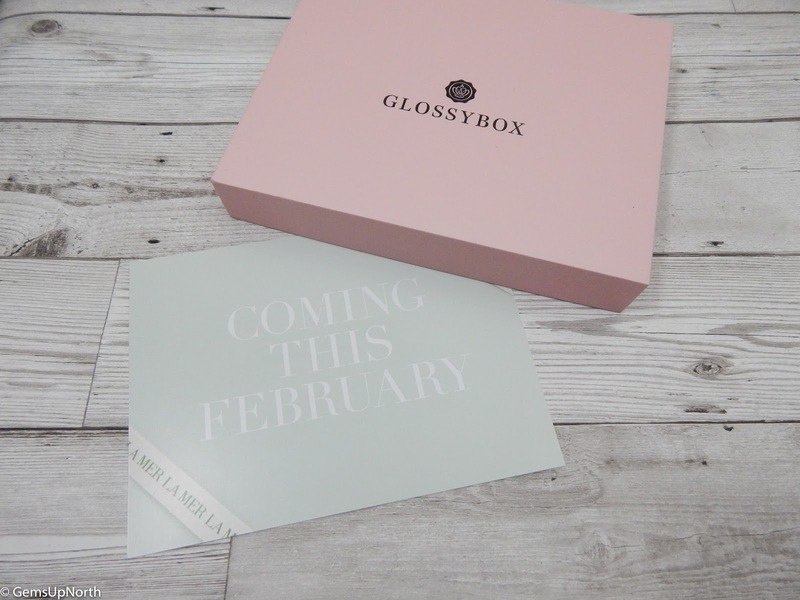 There's also a limited edition Glossybox on the way in February, they have collaborated with La Mer which is a luxury skin care brand. The box will feature skin care products from La Mer all boxed up in an exclusive themed box. You can register your interest here and be first in line to buy the box on February 20th and if your a Glossy subscriber the price drops to £35.00 (plus P+P) from £40.00.